An elegant yet powerful star rating system to allow your visitors to rate your content. View which posts, pages, or comments have the most ratings. Easy to manage options that support posts, comments, and even custom post types. 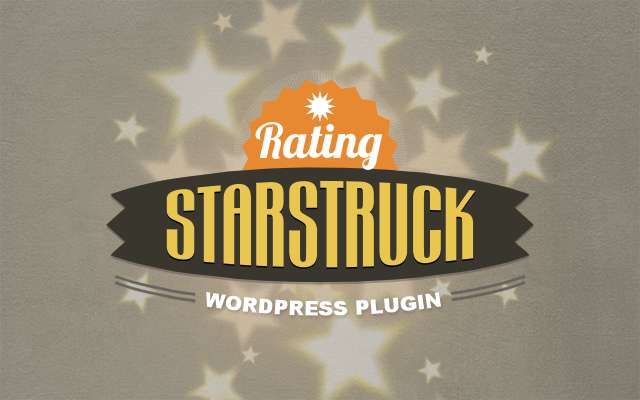 StarStruck is a fast, lightweight, and elegant star rating system. It works with any WordPress site and is a breeze to setup. Your visitors can then rate a comment, post, or page with a click of a star. It’s a great way to engage with your visitors and see which comments/posts/pages are most popular. Then take action based on overall data collected. 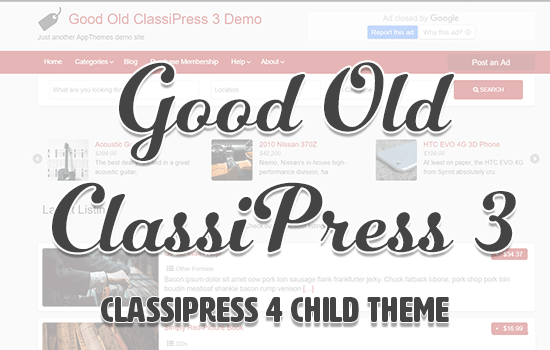 It’s so good, we use it on AppThemes.com (See example here. Scroll to the bottom). How do I verify my website is configured correctly? Use the Google Structured Data Testing Tool to verify that your markup is well-formed and can be processed by Google. How can I preview what my site will look like in Google? It usually takes a few weeks before Google will show the star ratings in their search results. If you’d like to confirm everything is working correctly, you can Fetch your Website as Google. This is a tool that allows you to test how Google views your website which should show you the star ratings in action. Before you can use the tool, you must have your website verified and setup in Google Webmaster Tools. Here’s a good tutorial on how to use the tool. How long does it take for rich snippets to be visible? Once you’ve installed the plugin, Google will discover it the next time they crawl your site (although it may take some time for rich snippets to appear in search results, if they do choose to display rich snippets for your site). It takes time for Google to re-crawl your site and for rich snippets to appear in their search results. If it’s already been a few weeks and you tested your site’s markup and ran the Fetch as Google tool per above and they still don’t show up, read their FAQ. Are there any filters or hooks? Yes. There are several filters built into the plugin. These allows developers to modify the StarStruck content before it’s returned to the browser. starstruck_content – executes before StarStruck is displayed on the post/page. starstruck_comment – executes before StarStruck is displayed on each comment. starstruck_mini – executes before StarStruck is displayed as read-only values. starstruck_sidebar – executes before StarStruck is displayed in the sidebar. startruck_template – executes before a StarStruck template (top ratings or content) is displayed. The best way to figure out how filters work is by looking at the source code. You’ll be able to see the exact parameters and how the function works. // always make sure to return the content! For more information on how filters work, see the WordPress Codex. Have a suggestion for a new filter or action? Let us know in the comments below or our support forum. It’s easy to install the plugin. Just follow the steps below. What’s most important is to verify that your theme has microdata setup correctly. Once you’ve done that, see the FAQ tab for more guidelines. Click on “Upload” and then “Choose File”. Browse to the starstruck.zip. On the plugins page, scroll down and find “StarStruck. Click on the “Activate” link. If you site has already been configured with microdata, StarStruck will automatically work once you accumulate ratings. Google provides a free testing tool to see if everything is configured properly. If so, you’ll see the star ratings in the results. 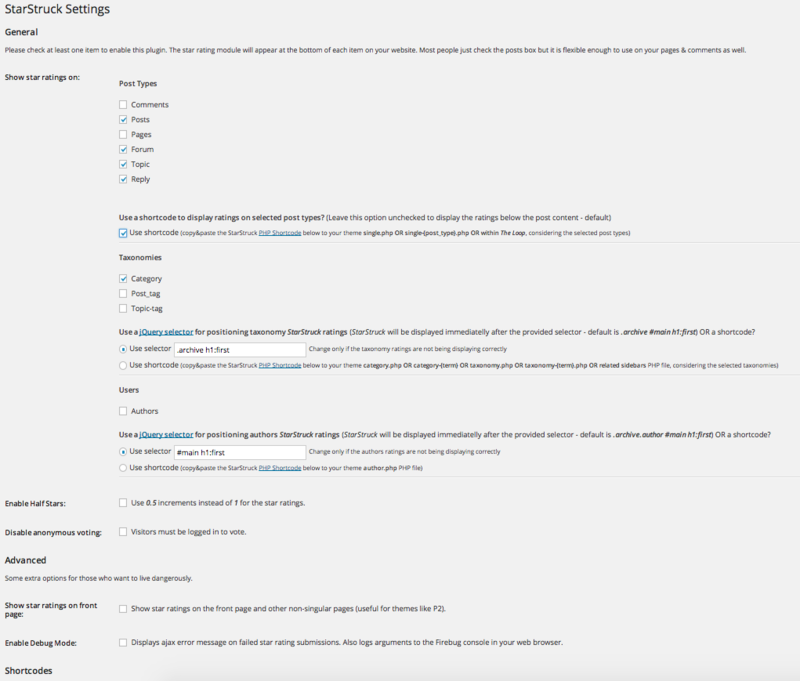 If not, chances are you need to add microdata tags to your WordPress theme. The exact tags depend on the content StarStruck is displayed on. For this example, we’ll use the BlogPosting item type. If you’re familiar with editing theme code this will be easy to do. You’ll need to modify your theme’s single.php (or possibly content.php or loop.php) file. There might even be a plugin that does this for you without having to edit the theme files. For different microdata item types such as products, restaurants, etc, see the Schema AggregateRating page. We have this setup on our Marketplace (see the right sidebar) and you can do it too. Just add the following code to your theme’s sidebar.php file. Note: You might need to add some custom styles to match your theme. Added JSON-LD schema format for structured data. Alas, can’t get it to work with a shortcode – both inserting into PHP directly and post body. This is even more misleading since all the necessary settings are present in the admin. Posted a question on the support forum but only silence thus far. I would expect to be able to change images, change text, and have a lot more configuration for a paid plugin. A waste of $17 bucks. Next! nice plugin……why always the same ugly yellow star option…..why not round and blue? So i hope an Update will be come out shortly or i hope for an Refound! StarStruck 2.4 just released. Issue with PHP7 incompatibility is fixed. its hard to see a plugin is runs oft of date. So please Update the Plugin. Google says there are Errrors with “AggregateRating” in Forum still is no support. So why we doesnt become a refound!?! Please update the Plugin and please integrate it form google’s Rich-Snippets Code. The plugin was recently updated to version 2.4. The problems mentioned in comments above were fixed. Please, make sure you’re using latest version. I have installed 2.4 and Google Says the Problem is not resolved. Could you provide a link to a page of your site where i can check it? You can send it to my email address afrolov@appthemes.com. Star rating is now showing in Google search and I posted a thread for my questions five days before. I didn’t get any answer. I am really surprise about the support of the paid Plugin. If it does not work and have no support, I want to get the refund. How can I get refund? @jpspnp, can you provide a link to your support thread so we can respond? Thanks. Thanks @jpspnp. I’ve responded to your thread. Sorry, I meant Star rating is not showing in Google search. @Jens, we provide support in our forums so please post your question there. Thx. Just wondering, would this plugin be able to ad ratings to BuddyPress groups? My big wish is a refound! Hi Jens, please post your questions in our forum and someone will help you there. Hi there, how can I display the breakdown of the ratings on the listing’s sidebar? Like you guys do for each plugin. Mike, see the “Install” tab above for instructions. Does it work with clipper store . I want to rate store. thank’s. Any update for this plugin to support translation and customization . Hi @mouradbouikni, it does support translation. I have translated the plugin into Spanish without a problem. Would you please confirm that purchasing and adding this plugin to Vantage 3.0.5 will resolve the issue with Google complaining about both ‘aggregateRating’ and about the ‘author’ field being missing? Hi @carpediemtim, Vantage 3.0.5 is too old. I think you should really consider updating the theme before purchasing this plugin. Thank you for your opinion, but I have good rain for being on that version, and your response doesn’t answer the question. Hi, yes I understand what you mean. However the reason for my reply is because there has been a lot of changes made to the theme and improved the code substantially from version 3.0.5 to version 4.2.2. However I have not tested this plugin with the latest Vantage version 4.2.2, so I really can’t confirm. …or at least so I thought. I revisited the topic when it came up here, and it seems that feature does work how I’d like it too. The developer just failed in their job of explaining that. Anyway, if you can’t confirm this plug resolves the issue with 3.0.5 and you can’t confirm that it resolves the issue with 4.2.2, then what – if any – version CAN you confirm that this plugin resolves the issue in question? For future reference, this plugin definitely doesn’t help resolve issues with structured data on Vantage 3.0.5. I bought, installed, and activated it, and then realized that I had to enable it for Listings. And I went from having 10 errors and 18 warnings to 28 errors and 75 warnings in Google’s Structured Data Tool (https://search.google.com/structured-data/testing-tool/u/0/). I stand corrected. The change in errors was due to something else. Instead, this plugin appears to have done nothing (for Vantage 3.0.5). That plugin show stars on ads category, tags and single ads? Hi, this is how this plugins works. It allows your visitors to rate a comment, post, or page with a click of a star. Jump start your Clipper site with affiliate deals from iCodes. Captures detailed geographic info with new user registrations.